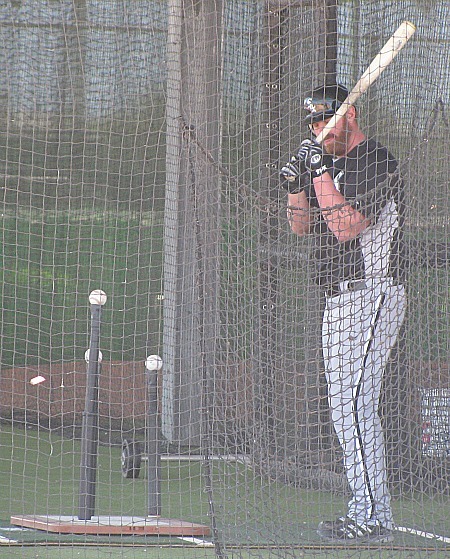 John Danks is set to start the team’s Cactus league road opener on Tuesday in Tempe against the Angels, with Jake Peavy pitching Wednesday at home against the Brewers and Gavin Floyd on Thursday in Surprise against the two-time defending American League champs from Texas. With Chris Sale pitching Friday in Glendale against the Cubs, the opening rotation appears to be set up, although nothing official has been announced by manager Robin Ventura past Humber on Monday. Jose Quintana starts Monday’s “B” game against the Indians, with Simon Castro and Brian Bruney also pitching. Will Ohman, Jesse Crain, Addison Reed, Hector Santiago, Pedro Hernandez, Charlie Leesman and Nestor Molina pitch Monday after Humber, who is ready to test his early work in actual games. James looks at Paul Konerko’s comments. J.J. and Tony Andracki post the 1990-1999 All-Chicago team. Will Carroll and Dan Wade published their 2012 White Sox team health report. Mike Newman scouts the toolsy Keenyn Walker and gives us his scouting report. There are quick takes for every prospect and a scouting report on Jake Petricka. Will Brent Lillibridge be the back-up ShortStop? Lillibridge already has done some work at SS. Could be the primary utility guy this season, at least at the outset. Maybe Jhan Marinez and Eduardo Escobar both won’t make the team. It looks as if @BSLillibridge will play pretty much everywhere in this upcoming season. I don't think he'll pitch. It’s all Brent Lillibridge, all the time! Hey, more than one Sox prospect! Sickels likes Molina. AJ Pierzynski on rail thin Chris Sale: "I saw Sale. He looks great. It looks like he put on a pound or two." AJ: sale looks like he put on a pound or two. He's like 150. Peavy is ten pounds lighter, about 190, to take weight off his right ankle. Weight watchers: Bruney is 30 pounds lighter, Peavy 10 lighter. Humber added about 20. Chris Sale: "I gained about 20 pounds this off-season and for some reason I lost it all before i came out here." Where do we start? Napoli, Fielder, Reynolds, and Braun have already established themselves as among the best power hitters in the game. Kinsler, Sandoval, Beltre, and now Morse have all shown good-to-great pop in the past too. Morrison doesn’t exactly strike fear into the hearts of opposing pitchers, but he’s a 24-year-old with a history of slugging in the minor leagues and a solid track record in the majors so far. The most noticeable change among the Sox’s traveling party was trainer Herm Schneider, who declined to disclose how much weight he lost this winter. 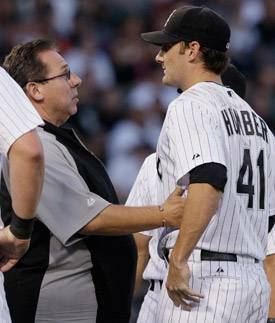 Nobody looks better than White Sox trainer Herm Schneider, who lost about 70 pounds over the offseason. James looks at Tyler Flowers replacing A.J. Pierzynski, and replays the April 12, 2008 Sox-Tigers game (Gavin Floyd’s breakout). J.J. looks at the battle for the last spot in the Sox bench, and contributes to publishing the All-Chicago 2000-2011 baseball team. Baseball America released its ‘2012 Top 100 prospects’ list. The only Sox prospect on the list is 23-year old RHP Addison Reed at #66. Twins assistant GM Rob Antony … said that some internet rumors about players on the trade market often lead to exploratory conversations between GMs about said players. “There are a lot of names that pop up where we do a lot of that same thing. ‘Look, if you’re looking to move this guy, he could be a fit over here. I don’t know what’s fact and what’s rumor, but if you are serious in trading a player we’d like to be kept in mind, we have some interest,’ ” Antony said. I’m hearing Boston will acquire RHP Gavin Floyd from the Sox for RHP Anthony Ranaudo and C Ryan Lavarnway. Asked if he'll be running a dictatorship as White Sox manager, Ventura joked "Absolutely. My way or the highway." That’s what Baseball America’s Jim Callis reports. To sign 8 of the first 10 picks in the 2011 draft the Sox spent $2,126,300. They spent $2,786,300 for the entire 2011 draft class. As Callis says, the amount for the 2012 draft can only change if Derrek Lee signs a major league contract which he says is unlikely at this point. BTW, Seedling To Stars’ Drew Balen looked at how the new draft signing bonus rules will impact the 2012 draft.